One of a handful of towns located on the eastern shore of Lake Como, Varenna, Italy is considered one of the most picturesque. Situated 38 miles north of Milan and about 21 miles from the Swiss border, this pretty little fishing village boasts a charming network of cobbled lanes, art-filled churches and spectacular villas. 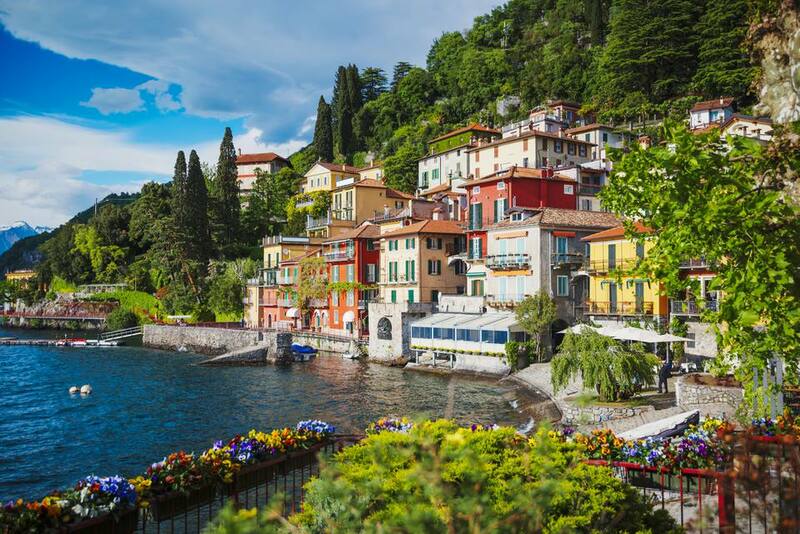 It's the perfect place to escape the crowds of tourists who tend to flock to the lake's largest city, Como, or to its more famous neighbor, Bellagio. With an unusual three-nave design and ebony-colored floor made of Varenna's famous black marble, the Church of San Giorgio is considered a masterpiece of Lombardy architecture. Located on the town's main square, the Romanesque- and Gothic-style church was consecrated in the early 13th century. On its facade is a portrait of St. Christopher (the patron saint of boatmen). While the basilica is somewhat austere, it still boasts beautiful and ancient frescoes and other important works of art dating from the 15th to 18th centuries. The bell tower and the baroque altar of red and black marble were added later. Built in a combination of styles (Baroque, Classic and Moresque), Villa Monastero has one of the most beautiful views of the lake in the area. The property was founded sometime in the 11th or 12th century and once served as a Cistercian convent before becoming the private home of a noble family. Today, Villa Monastero houses a museum, lush botanical gardens, and an international conference center. Hovering above the town's main piazza, Castello di Vezio is a former fortress with vistas spanning across the lake, to the Alps standing majestically in the distance. The strategically important site has been occupied since the Iron Age, but the current Tower of Vezio was constructed in the 11th to 12th centuries. It's open to visitors from March to the beginning of November. Built and renovated over the 15th and 19th centuries, Villa Cipressi (meaning house of the cypresses) is a property with a terraced, botanical garden, which seems to spill right into the lake below. It now functions as a high-end hotel, with restaurants and bars open to the public. The gardens are also open for public tours, seasonally from April to October. This little hamlet and river, less than a mile from Varenna, is the shortest tributary in Italy at just 820 feet long and only flows six months out of the year. Named for the effect and color of the waters (which appear to be like frothy milk or latte in Italian) the river's origins are still a mystery today. Fun fact: the river once caught the attention of Leonardo da Vinci, who studied its strange and intermittent flow. If you walk to the river's head, there you'll find a picnic area with facilities. Dating back to the Roman era, Sentiero del Viandante once connected Milan with what is now Switzerland. Today, it stretches along the eastern shore of Lake Como from Abbadia Larian to Piantedo, totally some 28 miles in length. The walking path can be divided into three or four stages, depending on one's training and stamina. It also intersects railway routes along the Tirano-Sondrio-Lecco-Milano line, so it's quite possible to take a stage at a time, returning to the starting point of each stage by train. From Varenna, there are three starting points of the hiking trail: Varenna to Bellano, Varenna to Lierna, and Varenna to Albiga in Perledo. From Varenna’s pier (at the ferry terminal), the scenic and romantic Passeggiata degli Innamorati (Lovers’ Walk) runs along a promenade above the lake's edge leading to the heart of the historic center, which is lined with characteristic restaurants, cozy bars, and artisan shops. It's a truly enchanting walk through a storybook Italian lakeside town. This civic museum houses a rare collection of non-migratory and sedentary species of birds found in the Lake Como area. Dedicated to its namesake, Luigi Scanagatta — a teacher and scholar of ornithology (the study of birds), malacology (the study of mollusks) and botany (the study of plants), the museum contains a science library containing more than 1,500 volumes. Each July marks the Festival of the Lake, celebrated with a fireworks display and a reenactment of the famous battle of Island Comancina. The story of this great conflict goes that in 1169, the warriors of Como, led by Federick Barbarossa, set fire to the nearby island, forcing its inhabitants to flee to Varenna. Having been sacked themselves nearly four decades earlier, the townspeople empathetically welcomed the refugees, and in doing so, became one of the richest communities on the lake. Which Cities Should Include on Your Tour of Italy?